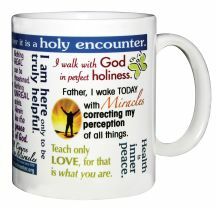 This high-quality Miracle Mug, encircled with fifteen of our favorite inspirational quotes from A Course in Miracles, was exclusively designed and created by your Miracle Distribution Center family. Our hope is that each quote will bless you as you pour your first cup of coffee into the mug in the morning until you sip your last cup of tea at night. The quotes were chosen to encourage and remind you of the joy and support you are entitled to every day, every night, and every moment of the day. Dishwasher and microwave safe. The price includes free shipping to U.S. addresses. Proceeds from your purchases fund the many free services we provide as a 501(c)(3) non-profit organization founded in 1978 to extend the principles of A Course in Miracles.